It’s fun to look at people on city buses. There’s the teenage wannabe punk, with spiked hair and iPod headphones blasting a jangly mess of chords into the surrounding rows. There’s the harried mom of three, fretfully herding her brood into a row a seats near the back. There’s the elderly gentleman teetering his way onto to bus and staunchly refusing the seats offered to him as he clings precariously to the hand bar. There’s the young woman balancing a large, wobbly, steaming pie between two oven mits as the bus hurtles over the pot-holed streets. Oh wait, that one’s me. Not many people try and take a pie fresh from the oven across the city of Chicago via public transportation. And if you ever hear of someone reaching their destination with their pie untarnished, they deserve a medal. A pie, I have learned, is meant to be eaten close to home. They aren’t built for travel via air, bus, or rail. They don't pack conveniently into boxes or tins. You can't simply throw one in a tupperware and expect it to arrive unscathed. Why, I asked myself while heading north on Bus 50, is a pie the symbol for classic American home-life? It’s because pies don’t leave home without a fight. And that, in a pie-shell, is what I learned last Sunday afternoon. That being said, the pie still tasted just fine. In fact, it tasted darn right dandy. I just wish I had been able to present it to my dinner hosts in a somewhat more presentable state. C'est la vie. 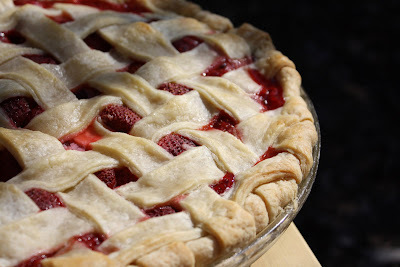 If you bake a succulent little pie such as this strawberry number below, I advise you to not export the pie, but rather import the pie-eater. And believe me, one whiff and those pie-eaters will be barging down your door. Step one: Combine the flour, salt, and sugar in a food processor and pulse once or twice to mix. Add the butter and process for about 10 seconds, or until the mixture resembles cornmeal. Put the mixture in a bowl and add the ice water. Mix the dough with your hands (the fun part!) until you can form a ball. Divide the dough into two balls, wrap the balls in plastic and either freeze for 10 minutes, or refrigerate for 30. Flour a flat surface and place one chilled ball of dough in the middle. Using a rolling pin and working from the center outwards, roll the dough out flat until it's diameter is at least 2 inches wider than the pie dish on all sides. Using the rolling pin for support, drape the flattened crust over the pie dish and gently press into place. Repeat process with the second ball of dough, but this time cut into strips about 3/4 in. thick. Set aside. Step two: Heat oven to 450 degrees. Gently toss the strawberries with the sugar, cornstarch, salt, and spices. Pile the mixture into the prepared pie crust, heaping it a bit higher towards the center. 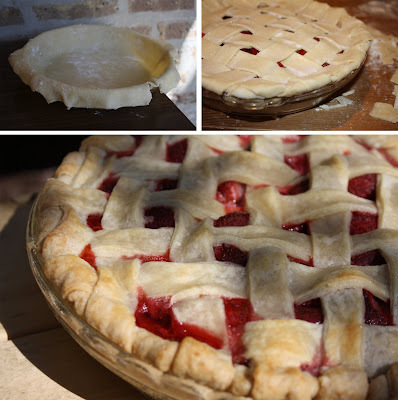 Using the strips of dough, prepare a lattice top (click here for an excellent visual demonstration of how this is done). Seal the edges by folding crust under and gently pressing down. Brush the top crust with the milk, and then sprinkle with a bit more sugar. Step three: Put the pie on a baking sheet and bake for 10 minutes, reduce the heat to 350 and bake for another 50 minutes, or until the pie is golden brown. 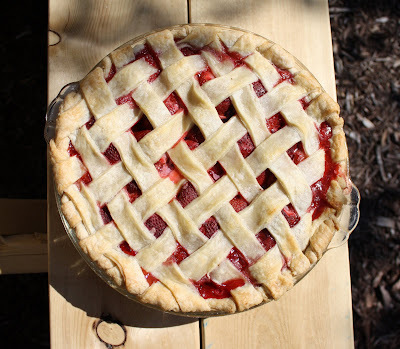 Be sure not to underbake your pie, because this is very easy to do. Cool on a rack or windowsill before serving warm or at room temperature. It's delicious with whipped cream, ice cream or all on its own! P.S. I had a bit of extra pie crust left over so I rolled it out and filled it with fresh mango tossed with dried shredded coconut and a bit of sugar. 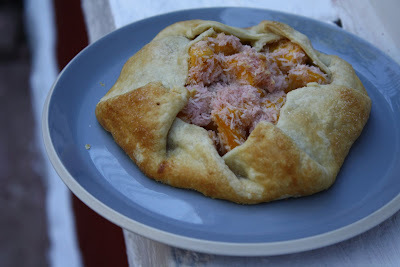 Then I folded the sides in to make a tropical fruit galette. Strangely, it wasn't actually too bad. Noah and I wolfed it down while watching the Blackhawks play on TV. I mean, if I freshly baked tropical fruit galette isn't sports watching food, I don't know what is.